Fayose urged Nigerians to protect their votes during the elections in 2019. 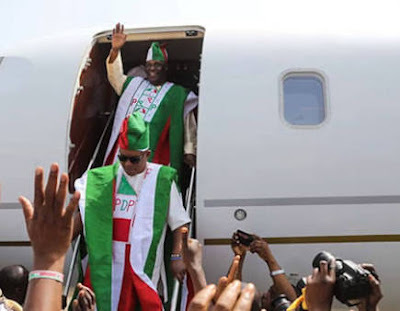 He said, “The only product we are selling is Atiku; PDP and Atiku. That is the product; the product that will come forward and participate in the debate because I can tell you authoritatively that Buhari will not come. Fayose claimed that the PDP and Atiku had already won the election, telling Nigerians that Buhari would boycott debates because of the fear of Atiku. 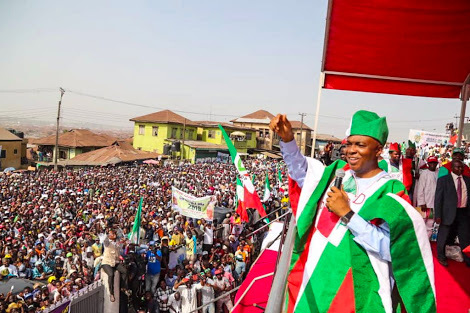 Daniel noted that the presidential election would be a family exercise because Atiku’s first wife was from the South-West and that the candidate started his career and lived in Ibadan as a young man. 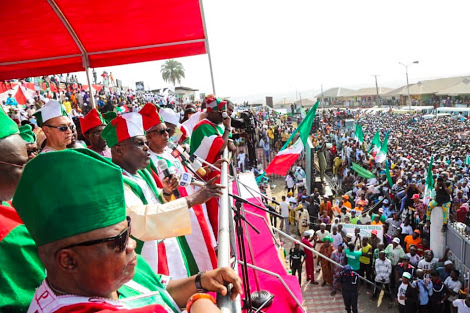 Secondus urged the South-West people to vote for Atiku, assuring them that the PDP would return the glory of Nigeria where living would be better as the candidate had the blueprint to rescue Nigeria from its multifaceted problems. The governorship candidates of the party that attended the rally were Mr Seyi Makinde (Oyo); Mr Jimmy Agbaje (Lagos); and the duo of Oladipupo Adebutu and Buruji Kashamu, who were fighting over the Ogun State PDP governorship ticket. Other dignitaries at the rally were Ms Jumoke Akinjide, Senators Ben Murray Bruce, Dino Melaye, Hosea Agboola, Ademola Adeleke; Dr Doyin Okupe, Mr Segun Sowunmi, Alhaja Bose Adedibu, Alhaji Tajudeen Oladipupo, Reverend Bunmi Jenyo, Alhaji Shuaib Oyedokun, Alhaji Hazeem Gbolarumi, and Mr Femi Jogor.